There is no goods in the shopping cart ! Biotinylated Human CD27 Ligand, Fc Tag (TN7-H82F4) is expressed from human 293 cells (HEK293). It contains AA Gln 39 - Pro 193 (Accession # P32970-1). This protein carries an Avi tag (Avitag™) at the N-terminus, followed by a human IgG1 Fc tag. The protein has a calculated MW of 45 kDa. The protein migrates as 50-60 kDa under reducing (R) condition (SDS-PAGE) due to glycosylation. Biotinylation of this product is performed using Avitag™ technology. Briefly, the single lysine residue in the Avitag is enzymatically labeled with biotin. Less than 1.0 EU per μg by the LAL method. >85% as determined by SDS-PAGE. Lyophilized from 0.22 μm filtered solution in 50 mM Tris, 100 mM Glycine, pH7.5. Normally trehalose is added as protectant before lyophilization. Contact us for customized product form or formulation. Please see Certificate of Analysis for specific instructions. For best performance, we strongly recommend you to follow the reconstitution protocol provided in the CoA. For long term storage, the product should be stored at lyophilized state at -20°C or lower. Please avoid repeated freeze-thaw cycles. -70°C for 3 months under sterile conditions after reconstitution. 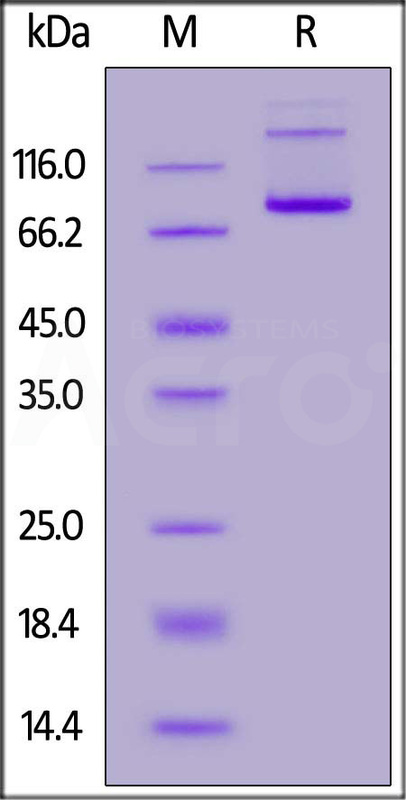 Biotinylated Human CD27 Ligand, Fc Tag on SDS-PAGE under reducing (R) condition. The gel was stained overnight with Coomassie Blue. The purity of the protein is greater than 85%. Immobilized Human CD27, Fc Tag (Cat. No. 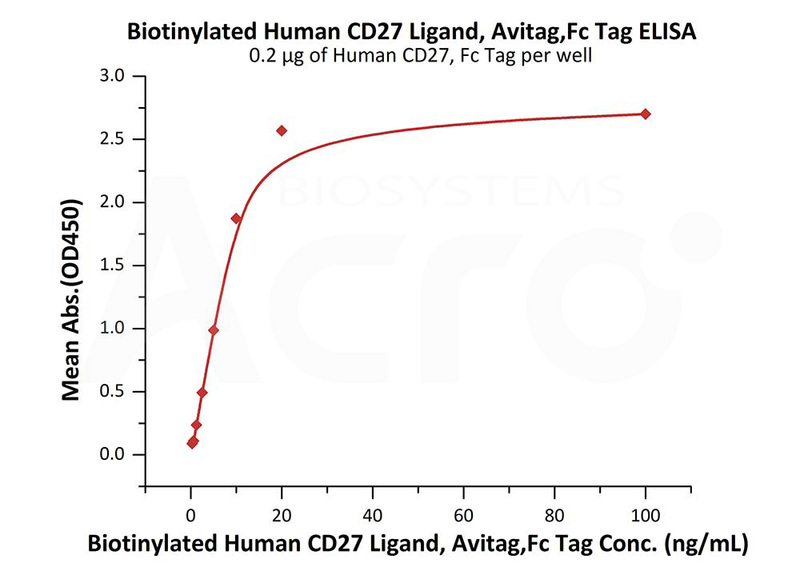 CD7-H5254) at 2 μg/mL (100 μL/well) can bind Biotinylated Human CD27 Ligand, Fc Tag (Cat. No. TN7-H82F4) with a linear range of 1-31 ng/mL (QC tested). Cluster of Differentiation 70 (CD70) is also known as CD27 ligand (CD27L / CD27LG), TNFSF7, TNFSF7G, is a type II transmembrane glycoprotein belonging to the TNF superfamily (TNFSF) and is a surface antigen found on activated T-and B-lymphocytes and mature dendritic cells. Binding of CD70 to its receptor CD27 induces in priming, effector functions, differentiation and memory formation of T-cells, and thus is invloved in the biological processes including T-cell activation, the proliferation of costimulated T-cells, as well as the generation of cytolytic T-cells. CD70 on T cells provides costimulatory signals that are required for T cell proliferation, clonal expansion and the promotion of effector T cell formation. CD70 on mouse B cell has been shown to inhibit terminal differentiation of activated B cells into plasma cells and enhances commitment to memory B cell responses. CD70 induces proliferation and IFNγ production, on NK cells. (1) McEarchern JA. et al., 2008, Clin Cancer Res., 14(23):7763-72. (2) Croft M., 2003, Nat Rev Immunol., 3(8):609-20. (3) Kobata, TS. et al., 1995, Proc. Natl. Acad. Sci. USA, 92: 11249–11253. (4) Raman V.S. et al., 2003, J Immunol., 171(11):5876-81. (5) Takeda, K. et al., 2000, J Immunol., 15;164(4):1741-5. Please contact us via TechSupport@acrobiosystems.com if you have any question on this product. This web search service is supported by Google Inc.